Conference Facilities South Africa has a comprehensive list of conference venues and centres with conference facilities in the Lowveld region of the Mpumalanga Province in South Africa. The Lowveld region of Mpumalanga is home to the seat of the provincial administration in Nelspruit, the famous Sudwala Caves and a botanical garden with an enormous collection of cycads as well as an African rainforest. The Kruger National Park is the largest game reserve in South Africa covering 18,989 square km and extending 350 km from north to south and 60 km from east to west. The park has 8 main gates that allow entrance to the different camps. The names of these gates are Paul Kruger, Numbi, Malelane, Crocodile Bridge, Punda Maria, Orpen, Phabeni, Phalaborwa and Pafuri. The Lowveld region covers the area of South Africa's Mpumalanga province between the Kruger National Park and the Swaziland border. The Lowveld region is primarily an agricultural area and a large proportion of South Africa's tropical fruit and vegetables are grown here. In the hills of the Lowveld you will find ancient rock paintings and engravings of the early Bushmen people who inhabited the many caves of the area. Visitors to the Lowveld can also see archeological ruins, old wagon trails and gold diggings. Nelspruit, the capital of Mpumalanga, is situated in the Lowveld region and the famous Sudwala Caves is just to the west of Nelspruit. Badplaas is a resort town situated in the extreme south west of the lowveld region of Mpumalanga. Badplaas is well known for its hot sulphur mineral baths and pools. Just to the south of Nelspruit you will find de Kaap Valley where some of the world's oldest sedimentary rock formations have been discovered. To the north of the Lowveld region of Mpumalanga is South Africa's premier game park, the Kruger National Park. Established in 1898 to protect the wildlife of the South African Lowveld, this national park of nearly 2 million hectares is unrivalled in the diversity of its life forms and a world leader in advanced environmental management techniques and policies. The Kruger National Park is home to an impressive number of species including 336 trees, 49 fish, 34 amphibians, 114 reptiles, 507 birds and 147 mammals. Man's interaction with the Lowveld environment over many centuries - from bushman rock paintings to majestic archaeological sites like Masorini and Thulamela - is very evident in the Kruger National Park. These treasures represent the cultures, persons and events that played a role in the history of the Kruger National Park and are conserved along with the park's natural assets. 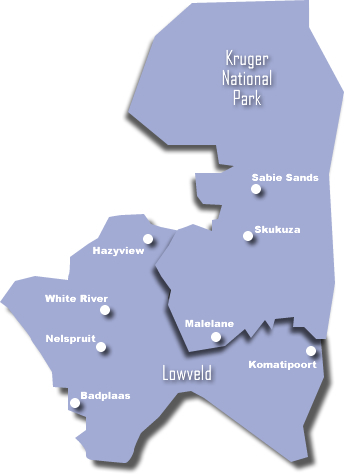 Some of the more important towns in the Lowveld and the Kruger National Park region include Badplaas, Balule, Berg-en-Dal, Biyamiti, Boulders, Chitwa Chitwa, Crocodile Bridge, Hazyview, Komatipoort, Letaba, Lower Sabie, Malelane, Marloth Park, Maroela, Nelspruit, Pretoriuskop, Roodewaal, Sabi Sands, Satara, Shimuwini, Skukuza, Tamalati, Tamboti and White River.